This Oreo Cupcake recipe is for every cookie lover out there. A moist and light chocolate cupcake with a rich chocolate ganache that is topped with a cream cheese frosting. I was sent some Oreo Cupcakes for my birthday that I fell in love with. 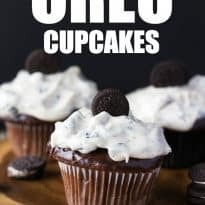 Something about cookies and cream cupcake that is hard to resist, I thought I need to get to work to create my Oreo Cupcake recipe! I am sure you have seen your fair share of Oreo Cookie Cupcakes on the Internet. My recipe stands out! The layer on top of the cupcake amplified the rich chocolate flavor, and it gets tamed down with the cream cheese frosting! These Oreo Cupcakes would be good any time of the year. Birthday parties, bake sales, holiday gatherings (especially summer cookouts), baby showers, play dates, and the list goes on! One question I get asked is, do I have to make it with a boxed cake mix? The answer is no! Feel free to use your favorite chocolate cake recipe. Or if you prefer to skip the chocolate and make a white cake, go for it! Yes! 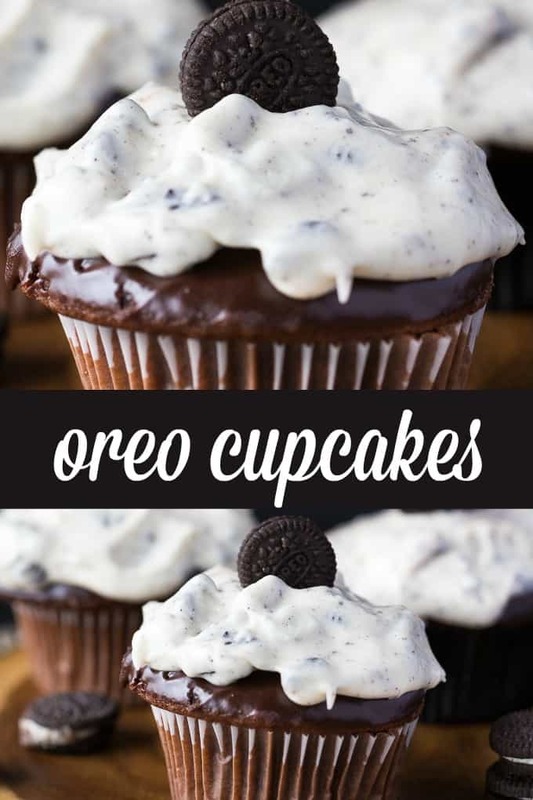 Whether you crumble up Oreos and stir in batter or lay a whole Oreo at the bottom of the muffin tin, so each cupcake has a surprise Oreo at the bottom of the cupcake. I find this is sweet enough as is, but yes, you totally can go that extra step for more cookie flavor in each bite you take. The biggest thing I can’t stress enough is to work with softened cream cheese. This will give you that silky smooth texture for the frosting. If your cream cheese is not softened, it will be hard to mix and leave lumps behind. If you start working with cream cheese and notice it isn’t all softened pop in the microwave for five-second intervals and stir to ensure it becomes creamy. Just don’t melt the cream cheese. You want the Oreos to be finer crumbles. You can either grab a food processor or reach for a sealable bag and rolling pin. If doing bag option, place cookies in a bag and seal it up. With your rolling pin apply pressure and roll back and forth crumbling your cookies up. Reach for a hand mixer or stand mixer for your frosting. It will give it a nice whip in a fraction of the time! You will get a creamy frosting in no time, and save your arm and shoulder a lot of stirring. Start by making your cake batter by following the instructions on the back of the box. Place on a cooling rack and allow to thoroughly cool before you move on. Once cupcakes are cooled, work on your ganache in a microwave-safe bowl, and your semi-sweet chocolate chips and whipping cream. Heat for 1 to 1 1/2 minutes or until your chocolate is fully melted. Dip each top of the cupcakes into the ganache, then toss in the fridge for around 10 minutes to let it harden up. While they are cooling in fridge work on your frosting. Beat your cream cheese and butter in a large bowl, then slowly add in milk and vanilla. Next, slowly incorporate your icing sugar, and then once creamy and the right consistency, toss in chopped cookies. Frost cookies and top with a Mini Oreo Cookie. Because you are working with a cream cheese frosting, these cupcakes will need to be stored in the refrigerator. You can store them in the fridge for 3-5 days, and then they will begin to dry out and need to be tossed out. You sure can freeze Oreo Cupcakes! Just place them in a container with a lid that is freezer safe. Then freeze up to 2-3 months. Thaw in the fridge and serve! They will thaw beautifully and taste just as good as the first day. Give these cookies and cream cupcake today. I think you and your family will enjoy the cupcake! 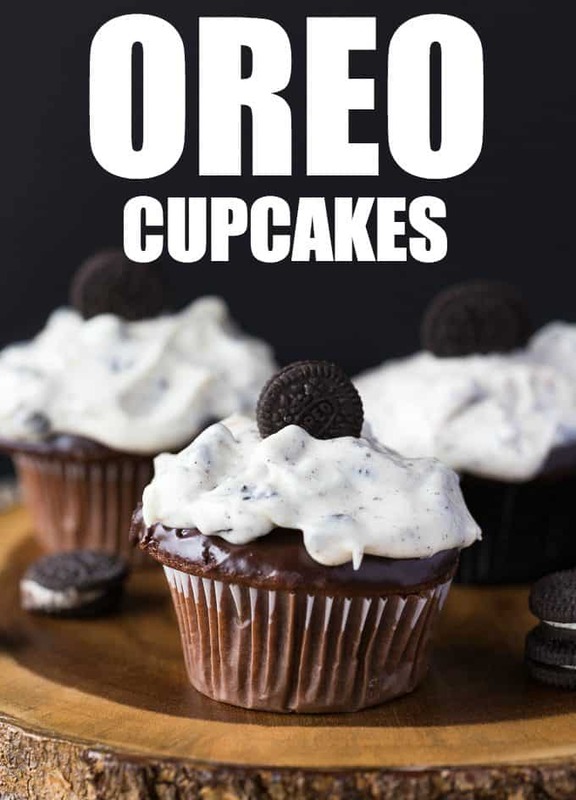 Have you tried an Oreo Cupcake recipe before? Chocolate cupcakes topped with a rich chocolate ganache and cream cheese & Oreo frosting. Microwave semi-sweet chocolate and whipping cream in a small bowl for 1 to 1 1/2 minutes or until chocolate is completely melted and mixture is well blended, stirring after 1 minute. Dip tops of cupcakes in chocolate glaze. Refrigerate for 10 minutes or until firm. Beat cream cheese and butter in a large bowl with mixer until well blended. Add milk and vanilla; mix well. Beat in icing sugar until well blended. Stir in chopped cookies. Spread tops of cupcakes with cream cheese frosting. Top with mini Oreo cookies. Recipe adapted from Kraft Foods. Is that a small or large package of cream cheese? These look delicious! I’ve pinned them to try the recipe later. Thank you! These look like the perfect midnight snack! Okay, I gained 5 pounds just reading the recipe! They look so good! What is icing sugar? These sound delicious! Thanks! It’s also called powdered sugar. I’m in Canada where it’s called icing sugar. These look soooo good, my mouth is watering. Thanks for sharing! I love a recipe that is easy and good and this fits the bill. My daughter has a major weakness for Oreos. I’ll be sharing this recipe with her for sure. These look amazing! Love that mini Oreo on top! Thanks for linking up with Funtastic Friday! Looks so yummy! My daughter would love these for her b day. Thanks for sharing at the Inspiration Spotlight party @DearCreatives. Pinned & Shared. Mmm, these look yummy! Hope you got your mixer back up and running! Thanks for sharing at Merry Monday this week!